turkey trot, originally uploaded by jahansell. They're always out there, in one particular field on my way to and from work. They are shy and hard to photograph - I'll keep trying to get one in full display because it's a sight to see! If you want to get a REALLY good look, head over to Brookville Daily Photo- his shots from yesterday are amazing! My neighbor lives on a small farm outside of our city and I was there the other evening. 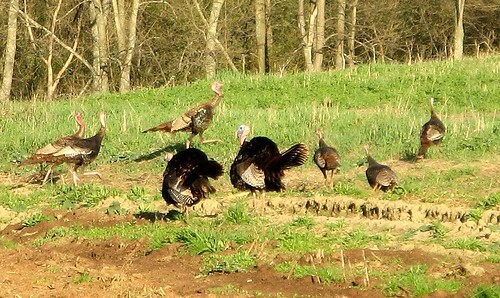 He was telling me that he came home and looked oput back and saw about 8 wild turkeys behind his house. I like your photograph and love to see things back in their environment and not kept in cages. Wow do they really roam free? What a wonderful sight.